Paul had spoke to Danny once more before standing up. "Sometimes you have too use your powers like that, but never use them to cause harm. We're humans not monsters." when Paul stood up Danny had brought a few flowers from somewhere and gave then too the girls. Paul had spoken at this point. "Um so what about that tour. " Zoey and Rose both smiled and thanked Danny. When Paul spoke up Zoey nodded, "Right, the tour. I guess we could start outside." She walked off leading the way after saying bye to Nemo and Danny, Rose waved bye to them and caught up with Zoey holding her hand. Zoey went to the front door, deciding she would start with the garden and work her way around. She opened the door and waited for Paul. Usually the head of the house would show the new comers around, but she hadn't been feeling to well lately. Zoey guessed she was caught up in paper work. Danny lead Nemo over to the game room in the orphanage. He went over to the chess set grinning at Nemo. Loser has to wear their underwear on their head for the rest of the day. Nemo snorted and started laughing at this. "Fine but the loser has to let the winner remove them and put them on their head." Danny considered this for a bit. Deal And so they began the great chess game war. Paul walked behind Zoey he watched as Rose ran ahead of him and the Two girls began to hold hands. When Paul got too the front door he asked. "So what's the first stop on this grand tour of my new home for the next 11 and a half months." Zoey gave a small smile, "Ah, lucky you. You'll be out of here in no time." She stepped out through the door, Rose let go of her hand, taking off at the sight of a butterfly giggling, "Look Zoey! This one looks like you, when you shift." Young Rose followed after the butterfly. Zoey smiled as she watched Rose. Zoey then turned to Paul, "This is the garden, the mistress loves flowers so whatever you do try to keep your fire away from here." Zoey gestured toward the hundreds of flowers, small bushes, and trees. Zoey herself had helped in planting some. Lots of people had surrounded Danny and Nemo's game of chess as they were well known for their hilarious bets on the games. The game was starting to wind down, Danny had his queen and a knight left but Nemo had both his rooks and bishops. Danny moved his queen in position to check the king not paying attention to where Nemo's pieces were. Nemo grinned triumphantly as his rook took Danny's queen. "Rook takes queen at C3." Danny tried to redeem himself but..." Bishop to H7 Checkmate." Danny squealed with displeasure before standing up and walking over to Nemo his head hung with shame. Nemo took his shorts down and off then his undies and placed the undies over his head before replacing the shorts. "For the rest of the day, Danny." Yeah, yeah.... I know. Danny said with a flush of embarrassment. They often did silly bets like this as with such matched skills it was 50/50 on who would win every time. Danny's loss made them even for wins and losses. Paul thought the Garden was beautiful. He smiled when Rose had took off after a butterfly. He looked at Zoey when Rose had said " This one looks like you, when you shift." Paul had spoken up "okay so try not too burn the Garden down........ And your a what a shape shifter." Paul would surely spend most of his time in the Garden as it was peaceful and Serene. It would keep his temper under control. Zoey nodded, "Yep." was all she said as she looked away. She didn't really like to flaunt her power. Turning she pointed to a walk way that lead around the building, "Shall we continue?" Rose then came running up taking Zoey's hand once again, her grin spreading across her face. Rose then began to skip, dragging Zoey along with her. Nemo walked Danny outside grinning like a loon. Danny reasonable embarrassed having his little boy Superman briefs atop his head, allowed the older boy his sense of victory. Don't worry, next time it'll be you who loses and the next bet will be even worse. "We'll see chump, we'll see." Danny solemnly walked alongside Nemo where they ran into Paul, Zoey, and Rose again. "Oh hello again, you three. Didn't expect to see you again until lunch." He said smiling not giving any answer to why Danny had his underwear on his head. Paul had once again began walking behind Zoey and Rose. He meet the two boys from earlier infront of the corner that rounded the building . He looked at the smaller boy with confusion. "so why..... Never mind" he waved his arm forward in a forget I said anything motion. Paul was just going to wait and see how events would unfold from here. "Why are your undies on your head, Danny?" Rose questioned curiously, her head cocked to the side. Zoey on the other hand was smiling looking at Danny, "Did you lose at Chess again?" Zoey guessed he had, she has watched them before, enjoying when one of them lost and had to do something silly. She wandered how close the game had been this time. Danny whined theatrically as he looked at them all. Yes, I lost at chess again! And of course I'm the one that decides what the bets are. Nemo just doesn't have my creativity when it comes to worthy humiliating bets. He said aloud looking at Zoey with a half-smile. You get my style of humor, don't you Zoey? Nemo smirks and playfully slaps Danny on the backside making him yelp. "Yeah yeah, I consider this payback for your... 10th won bet. I won't go into details but let's say it was creative... and very uncomfortable for me." Paul just stared at them all. He had no idea what was going on so it was best for him to stay quiet. The orphanage must have some sort of chest room. What Zoey had suggested it slightly. Zoey shook her head, a grin on her face, "You boys..." She looked down the walk way as Rose began to slowly tug her along, the child slightly impatient. "We are giving Paul a tour if you guys would like to tag along? We're heading to the playground at the back of the house." Rose said, slowly being drug by Rose. Danny smiled and shrugged his shoulders. Sure why not? Nemo shrugged as well and they began walking with the trio. "Zoey you gotta save me I think Danny might kill me with the next bed. I know him too well he'll make it so humiliating next time I'll die of humiliation!" He said theatrically his fear completely for show. Rose frowned slightly, "I thought big kids were suppose to be brave, not be cry babies." she piped in. Zoey merely shakes her head, "I can't wait to see it, I always enjoy a good show." She said as she glanced down at Danny, a grin on her face as the boy wore his undies on his head. Coming from around the side of the house the playground came into full view; Swings, Slides, Mary-go-round, Monkey Bars, anything you would find at a playground. Zoey turned to Paul as Rose skipped off toward the swings, "This, obviously, is the playground." she said gesturing toward it. Due to the fact that the building was secluded from most people, the thick of the forest was right behind the playground, a small chain-link fence separating it from there. Though when Zoey tried out shifting, sometimes she went into the forest. Nemo gasped and held a hand to his heart theatrically. "I am NOT a crybaby! Are you saying you want to see me die, Rose?" Danny smiled and ran over to sit in the swing next to Rose and began using his telekinesis to swing them higher and higher. Nemo watched with a fond smile on his face. Paul had just sat back and watched. Rose Drug Rose to the playground, after offering Danny and Nemo if they wanted to accompany them. Paul just laughed a bit when Nemo suggested that the next bet would kill him of humiliation. "don't worry buddy if it comes to that I'll put you out of your misery if that happens. He laughed before watching Danny and Rose run of to the swings. "how long have you all been here?" was the only thing Paul could muster up. 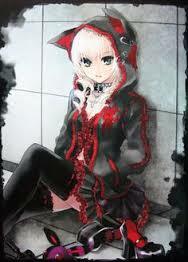 Kurai walked inside the front door of the orphanage and changed into more casual clothes. Kurai was one of the few teen-aged orphans with a job so he took his job seriously. Kurai walked out back to the playground to look for his sister since she wasn't in her room. While Draco was almost invisible to others, Kurai stood out and was easily noticed. A lot of teen girls around the orphanage had a crush on him because of his badboy looks and blood-red eyes but Kurai didn't care about having a girlfriend, all he cared about was his little sister. Kurai cared about her so much that he felt if she was gone his existance would be meaningless. Kurai walked over to Draco and leaned against the tree. Kurai rubbed Draco's head and said, "I'm back." Draco smiled and said, "Welcome back, big brother. How was work?" Kurai sighed and said, "Boring as usual, hanging the clothes and constantly being flirted with by annoying, shallow girls. How was your day? Did you make any friends?" Draco giggled as Kurai told her about work and said, "I had fun. I made lots of new friends." Kurai said, "I see, that's good. Who did you make friends with?" Draco replied, "A Hawk and some squirrels." Kurai sighed and said, "You know that's not what I meant when I asked if you made any friends." Draco looked down and said, "I know..." Kurai was approached by one of the girls at the orphanage, the girl confessed her feelings and Kurai sighed before rejecting her. The girl ran offf crying and as Kurai sighed in irritation, Draco looked up at her brother and asked, "Why don't you ever say 'yes' to a girl? You even say no to the pretty ones." Kurai chuckled and shook his head before replying, "Dating a girl just because she's pretty isn't my style. Most of the girls that confess to me are shallow and assume I'm going to say 'yes' because they're pretty. If I date a girl it's not going to just be about looks, it's also going to be about their personality. Besides, I'm not looking for a relationship right now. I've got the only girl I need right here." Kurai then ruffled Draco's hair. Kurai picked up Draco and sat down on the swing before placing her on his lap and wrapping his arms around her. Kurai loved his sister more than anything and he wasn't going to let anyone hurt her. Zoey looked at Nemo, "I don't play much in the game room if you would like to lead the way there, to show Paul around." Most of Zoeys time was spent in less populated areas, like the forest or the attic. Her senses seemed to perk at the sound of crying, and looking over she found the source of it. Yet again a girl and been denied by Kurai, she could see him sitting with his sister Draco on the old tree swing. The girls never seemed to leave the poor guy alone. Zoey couldn't exactly remember when the pair had come to the orphanage, but she had been jealous of the fact they were siblings. It made Zoey want a sibling, even though she and Rose were close, they weren't blood. At the thought of Rose she looked over, watching as Danny and Rose swung together, the young girl giggling. A window opened and the Mistress stuck her head out, calling for Rose. Zoey looked over at Paul and Nemo, "Catch up with you guys later." Walking over she waited for Rose to come off the swing, already knowing Rose would want her to tag along.